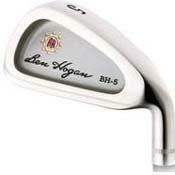 The new Ben Hogan BH-5 irons, the first fully cast stainless steel irons in the Ben Hogan product line. 17-4 Stainless steel cast construction with extreme perimeter weight design provides maximum playability, control and forgiveness. I purchased a set of non-offset BH-5 Irons looking for more forgiveness and hopefully distance. These irons delivered on both counts. They are a club longer than other irons I have played and for a cast club feel much softer than I expected. In my first few rounds played I flew the ball over several par fours and had to drop a club to compensate not a bad problem to have. They also allow the ball to be worked a bit as well. Buy these and you won't be disappointed. From a cosmetic standpoint the aren't as sleek as many forged irons but look as good as any other perimeter weighted club out there. The Hogan signature and logo look good. Need new iron set comtemporary version!! Good product, why not popular in past. Great clubs. Got them a little while back for $140 to use while I try to find my perfect iron set. Crisp, forgiving clubs that are long, ended up using them for just over a year and got me down to a single figure. Next irons: Nike VR Pro Combo. Still going strong after 4 years. Got these gems on sale at Golf Town and they're still crisp and deliver a great feel. Over the past 6 months my graphite shaft have begun to "pull out" of these irons to the point where I snapped the 8-iron. I'm going to nee to get a new set as there must have been some sort of epoxy defect over time. Several of the more heavily used ones (e.g. 7 iron) have approximately a 1/16" gap showing at the bottom. the grips showed a long shelf life, but that was easily fixed. I'm from the Philippines. I bought these clubs used (good condition)because of budgetary constraints. $177.00. I was using Cobra SS before. I find these forgiving and workable. It has a soft feel to it and i like its old school design. I will use these for a long time. I like the performance. The only problem is it does not age gracefully. the face is easily scratched. I just bought these irons and took them to Charlotte North Carolina to play a round with friends. I was extremely nervous because I didn't know how these irons would perform on the course. And all I can say is, Oh my. Wow, these clubs will improve your ball striking and give you confidence and hit your longer irons. These are a steal. I was so close to paying $400 for some Taylor Made's. Excellent value. I bought these used and like new at Golf Galaxy for $100 because I travel a lot and don't travel with my "regular" clubs. I took these with me to the WIlliamsburg area and shot some handicap reducing rounds for sure. The shots felt soft and solid off the face. Ball flight was higher than what I like, but since it was very straight, I can live with that. I like the straight forward simple look with the Hogan name and emblem in the cavity. The brushed satin look is also cool. I disagree with a different reviewer in that the Apex stock shaft is a very good shaft. It is the fore-runner to the TT Dynalite shaft. It is a great shaft for players not needing a Dynamic shaft. The tip is softer that the Dynamic for great feel and added launch to shots. It is not for everybody, but is a great shaft for most mid to high handicappers... who this club is excellent for. Can not beat this deal for what I paid!! !